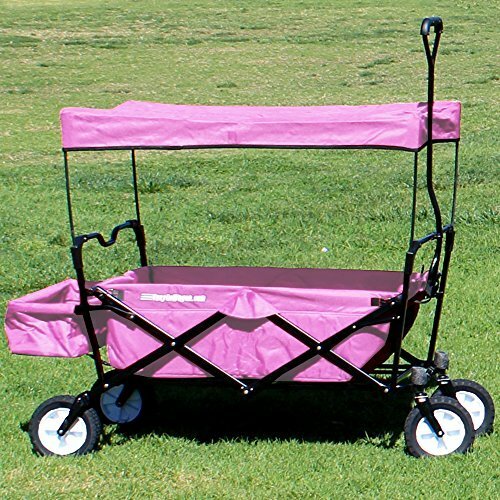 EasyGoProducts Foldable, collapsible all-terrain wagon is a premium quality wagon. 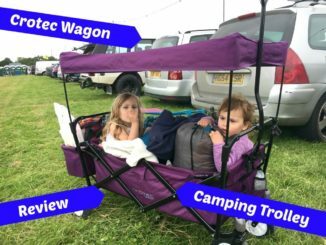 It is a fabulous choice if you are thinking to buy an all-purpose wagon for your groceries and sports camping needs. It is just the ideal choice for your haulage needs. 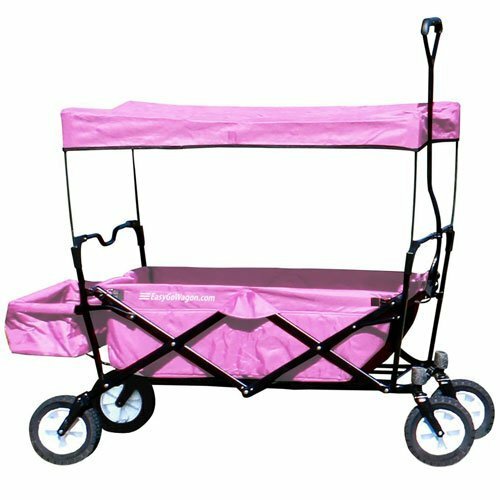 Portable and convenient patented folding design make this the most portable wagon on the market. 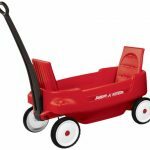 The foldable wagon comes with sturdy steel and ABS plastic parts that guarantee top performance and serves as a sure vehicle when you need to move heavy loads up to 150Lbs. 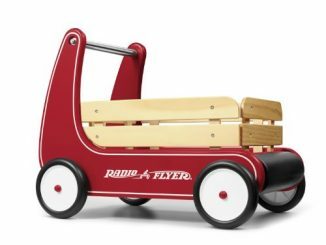 Our foldable, collapsible utility wagon with heavy-duty tires and wheels offers reliability and efficiency like no other wagon in the market. 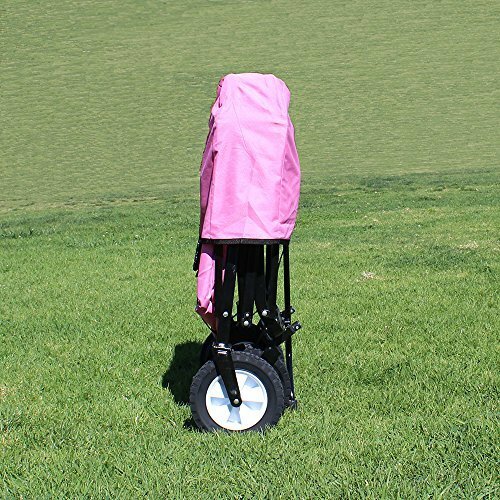 The easily removable waterproof 600D fabric canopy guarantees maximum UV protection during your outdoor trips to the beach, mall, or to sports events. It can be used round your home Garden when you need to move heavy equipment and loads around the yard. Large 8″ wheels roll over everything in its path effortlessly thanks to the handle pivots and the well-lubricated system which encourage hassle-free operation even in rough terrains. This wagon arrives fully assembled and ready to go. It is lightweight, compact and folds incredibly into its carrying bag for safe carrying. It is no more than 8″ when folded. Now, that’s the peak of portability! This is an ideal gift idea to purchase for your friends and relatives. Do not hesitate. Get one for yourself and additional units for your friends. 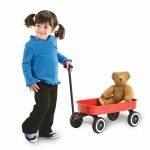 Add to cart now!QUICK HASSLE-FREE SET UP: Our collapsible wagon with heavy duty rubber tires can be set-up in just a matter of seconds. 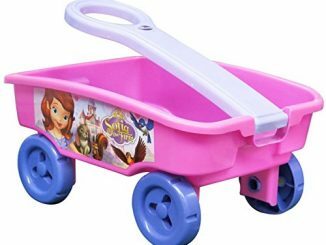 This collapsible wagon with canopy and durable rubber tires comes ready to use out of the box. 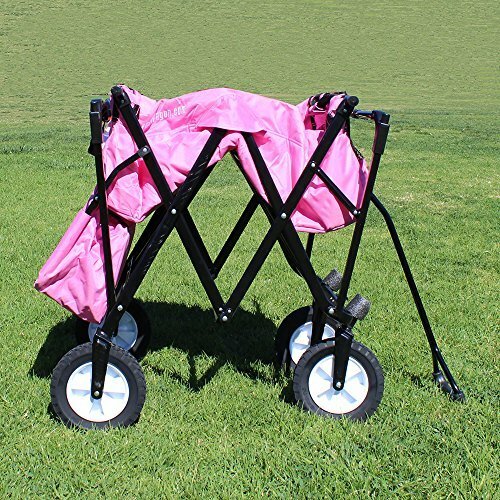 Thus, you do not need to worry about unboxing and assembling your newly purchased heavy duty collapsible wagon for sports. Just add the roof when needed. 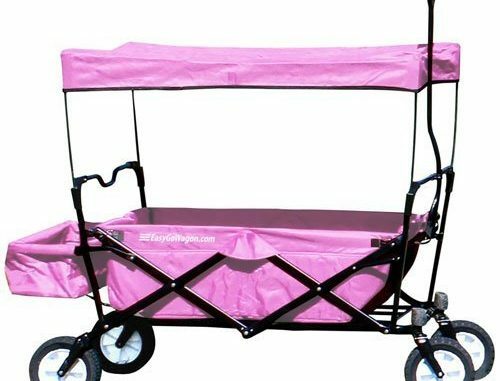 UV+WATERPROOF POLYESTER FABRIC: The body covering and canopy cover of our collapsible utility wagon beach cart is made of premium 600D fabric which protects the contents of your cart from harmful UV rays. The fabric is a special kind of fabric made for outdoor use and gives maximum protection from the elements. 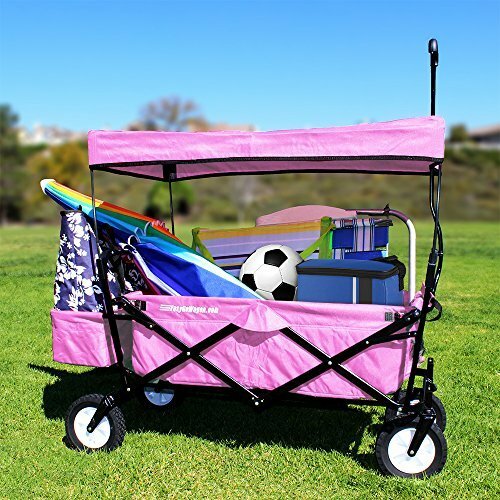 Rest assured of a weatherproof risk-free outdoor experience with EasyGoProducts collapsible utility sports wagon. 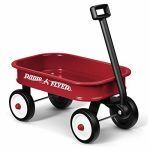 LIGHTWEIGHT AND PORTABLE: Our foldable, collapsible red wagon is lightweight and portable. 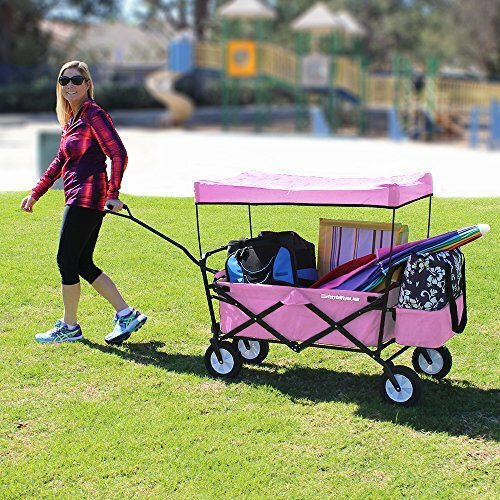 This collapsible beach wagon is equipped with rubber wheels which fold into a collapsible wagon storage bag which houses the wagon and makes for easy carrying. 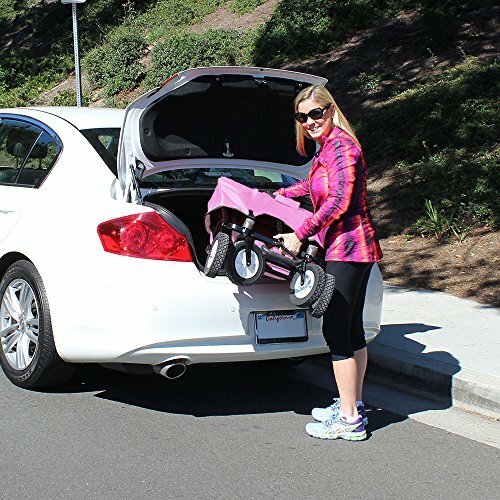 Easily fits into trunk of car when folded. 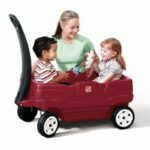 DURABLE AND RELIABLE PARTS: Our collapsible, lightweight outdoor wagon comes with tires made of rubber wheels, joints made of steel, and body made of steel and ABS plastic materials. These materials guarantee lasting performance and great value for your money. 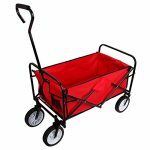 VERSATILE ALL-TERRAIN VEHICLE: Our collapsible wagon comes with heavy duty wheels suitable for usage on asphalt, concrete floors, dirt and on your lawn. Our heavy-duty tires measure 8″ in diameter and have the strength to function optimally at full load capacity. 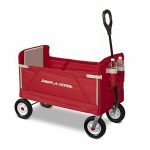 EasyGo collapsible wagon sports utility cart can haul up to 150 Lbs.